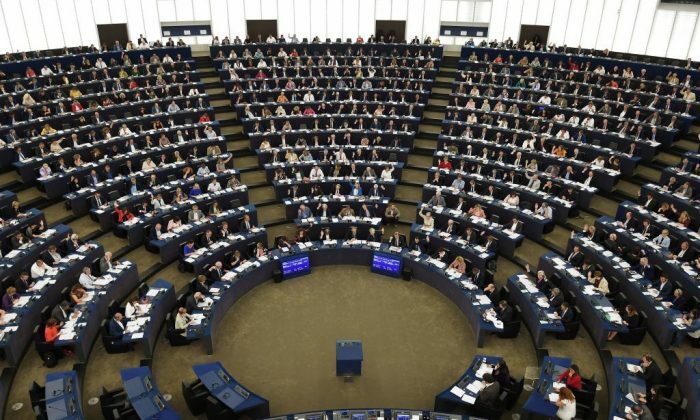 The resolution, drafted by Bas Belder, a Dutch politician and member of the European Parliament, received 530 votes in favor and 53 against, with 55 abstentions. Belder is a member of the Parliament’s Committee on Foreign Affairs. The resolution calls on EU and its member states to urge Beijing “to refrain from further military provocations towards Taiwan and endangering peace and stability in the Taiwan Strait.” Moreover, it calls for “peaceful means on the basis of international law” to settle any cross-strait disputes. Since April, Beijing has sent bombers, fighter jets, or surveillance aircraft to encircle Taiwan, acts of intimidation that serve as threats to the Taiwanese public to embrace the idea of unification with the mainland. Meanwhile, the resolution supports Taiwan’s participation in international organizations, such as the World Health Organization (WHO) and the International Civil Aviation Organisation (ICAO). For years, Beijing has rallied WHO and other international groups to exclude Taiwan. “Taiwan’s continuous exclusion is not in line with the EU’s interests,” the resolution stated. During China’s civil war, members of the Kuomintang retreated to Taiwan following a defeat by the Chinese Communist Party (CCP) in 1949. While China is under authoritarian, one-party rule, the island of Taiwan has transitioned into a full-fledged democracy with its own constitution, currency, and military. Relations between the two are fraught, as Beijing considers Taiwan a renegade province that must be reunited with the mainland one day, with military force if necessary. Taiwan’s sovereignty has thus become a political battle. In the EU’s latest resolution, it decided that it will still adhere to the “one China” policy, an agreement between China and Taiwan that both sides belong to the same China, but each side can interpret differently what “China” means. However, Beijing has interpreted the policy as meaning that mainland China is the only China. It has since pressured other countries to embrace its interpretation. In the past two years, Beijing has increasingly deployed “dollar diplomacy” tactics, providing aid and investments to Taiwan’s diplomatic allies in order to pressure them into breaking ties with Taiwan. In the two past years, São Tomé and Príncipe, Panama, the Dominican Republic, Burkina Faso, and El Salvador have all cut diplomatic ties and recognized diplomatic relations with China. While the resolution isn’t a formal piece of legislation, it still serves as an important reference point for how the EU might carry forth its relationship with China. The resolution also mandates that the European External Action Service (EEAS)—the foreign and defense ministry of the EU—will answer all questions European parliamentarians have about the EU’s dealings with China and Taiwan. In January, Cato Institute, a think tank headquartered in Washington, ranked China 138th out of a total of 150 countries on its human freedom index. The index placed Taiwan at 18th place, just one spot behind the United States. In a statement released by Taiwan’s presidential office, spokesperson Huang Chung-ye thanked the European Parliament for supporting Taiwan. Additionally, Huang stated that Taiwan will “vigorously defend against any infringement of the freedom, democracy, and well beings of [Taiwanese] citizens,” in the face of challenges from China. The U.S. government has shown similar support to Taiwan. On Sept. 3, senators Cory Gardner (R-Colo.), Ed Markey (D-Mass. ), Marco Rubio (R-Fla.), and Bob Menendez (D-N.J.) introduced the Taiwan Allies International Protection and Enhancement Initiative (TAIPEI), a bill that would require a U.S. strategy to engage with governments around the world to support Taiwan’s diplomatic recognition or strengthen unofficial ties with Taiwan. On Sept. 9, U.S. ambassadors to El Salvador, Panama, and the Dominican Republic were called back to the United States, in response to the three Latin American countries cutting ties with Taiwan to recognize China.